ROSE BIRD ON CROSSCURRENTS, 11/2 – Doggedly Yours… Howling, Humor, and History. 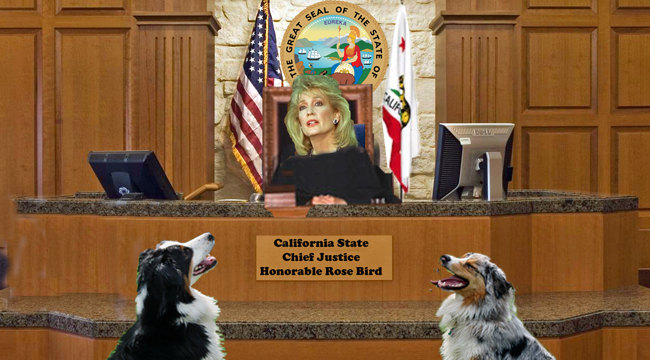 ROSE BIRD ON CROSSCURRENTS, 11/2: Becoming the first woman to serve as chief justice of the California Supreme Court, Rose Bird born on this date in 1936, led a progressive majority of the court strengthening environmental laws, consumer protections, and individual rights. Gavin and Wyatt stand before the bar with Justice Bird on the bench. You can become a “friend of the court” by joining John as he pleads his case for a Justice Bird birthday tribute on Crosscurrents, 11/2 at 8 a.m.